As the popularity of online shopping continues to rise, local e-commerce and trade platforms provide increased visibility for smallholder producers in global markets. E-commerce – the sale or purchase of goods or services via digital platforms – has emerged as the fastest growing global retail channel in recent years. The online food and drink market shows the greatest gains globally with an anticipated growth of 80% between 2018 and 2022. While the e-commerce market across Africa is predicted to increase from just under €7 billion in 2014 to almost €65 billion by 2025, the continent’s participation in online retail remains limited compared to the rest of the world. This is due to a number of key challenges including insufficient infrastructure, underdeveloped payment systems, poor ICT literacy, low purchasing power and consumer confidence, as well as inadequate national regulations and policies. To help businesses overcome such challenges, platforms for trade facilitation have also begun to emerge. In April 2017, the United Nations Conference on Trade and Development (UNCTAD) launched an online platform to help developing countries benefit from e-commerce. Through the ‘eTrade for all' platform, stakeholders can access an international network of technical and financial services to facilitate the development of e-commerce and the digital economy. “As the ICT infrastructure improves, payment solutions become available, trade policies are adapted to digitalisation, legal and regulatory frameworks are improved, and skills are developed, the environment for businesses to participate in the digital economy becomes more conducive,” says Torbjörn Fredriksson, chief of UNCTAD’s ICT Policy Section. The private sector is also contributing to the digitalisation of agricultural trade. Ghanaian company, AgroCenta (a winner of CTA’s Pitch AgriHack 2017), focuses on solving market linkage and financial inclusion issues in the agricultural value chain. Via its AgroTrade app, the company connects its network of 15,000 smallholder farmers to large off-takers, such as feed manufacturers and breweries. Since it launched in 2015, AgroCenta has increased farmers’ incomes by almost 25%. Listing farmers’ trade deals online enables them to make bulk sales and ensures they receive a fair price for their produce. 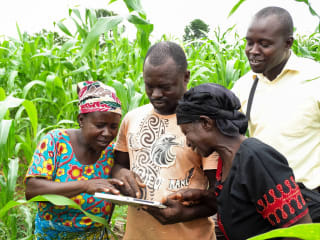 The company also provides farmers with financial statements for all goods traded on the platform; with access to these records, financial institutions are more likely to offer farmers loans so that they can invest in technology and inputs to increase their productivity. At the other end of the supply chain, the AgroTrade app enables large off-takers to source locally-produced raw materials, avoiding high import costs and supply shortages. With the ability to track the quantities of specific commodities available across AgroCenta’s farmer network, manufacturers using AgroTrade have increased their production capacity by 40%. Entrepreneurs have improved the flexibility and usability of e-commerce services through technological innovations. For example, another winner of CTA’s 2017 Pitch AgriHack competition, Farmart Ltd., has started using machine learning on their digital platform. When prospective customers visit Farmart’s website a ‘chat bot’ asks them what they are looking for and then directs them to relevant products. Algorithms are also used to recommend products to shoppers based on previous searches and purchases. “We try to stay ahead of the competition by improving the user experience,” explains Farmart’s CEO and founder, Abraham Omani Quaye. As a result, the company has rapidly grown its customer base to around 85 businesses and over 1,000 individuals since its launch in February 2016. Using a variety of technologies enables Senegalese company, MLouma, to deliver all of the market information farmers and agribusinesses need in order to make the best decision about when to sell or buy agricultural products. To maximise the accessibility of this information, MLouma has four channels of communication. Users can view products available in a specific area and advertise any products they would like to buy or sell via MLouma’s website or mobile app. However, for users with limited internet access, MLouma provides an SMS service that enables them to learn about product availability and market prices, as well as request to have their own products displayed for sale on the web platform. Finally, the company operates a call centre to assist individuals who cannot use the other three channels to make purchases and sales of agricultural products. As stated by Farmart’s Quaye, the key to remaining competitive in the fast evolving world of e-commerce is to build the company’s business model in response to users’ needs, which is exactly how Cameroonian company Jangolo has developed. After carrying out field visits, the company discovered that local farmers were losing time sourcing inputs and transporting produce to markets. As a result, Jangolo decided to diversify from simply providing an e-commerce platform, which initially accounted for 100% of the company’s revenues, and integrate logistics companies and input suppliers into their network. “We want to reduce the time that farmers have to spend on logistics and selling so that they can focus more time on farm production and training,” explains Bertrand Foffe, Jangolo CEO and founder. E-commerce now only makes up 7% of the company’s operations. The company’s integration of stakeholders along the entire agricultural value chain helps to spread operational costs and manage cash flow. When buyers come to Jangolo requesting a certain quantity of produce the company draws up a letter of intent agreeing on the price. Two weeks before harvesting the buyer pays Jangolo at least 30% of the money, which the farmers receive when the produce is collected. The buyers pay the remaining money on delivery of the produce, which is divided between the logistics company, farmers and Jangolo itself. This approach minimises the risk for all parties involved in the transaction and has enabled Jangolo to support 9,000 users, including 6,800 farmers. “All of our solutions are scalable, which means that if we grew to 2 million users tomorrow our system would continue to function just as well,” says Foffe. The potential of digital trading solutions to be scaled and spur economic growth is one of the reasons that the African Union (AU) is promoting the creation of an ‘integrated e-economy’ through its Agenda 2063. However, to facilitate e-commerce companies to operate at regional and international levels, the continent needs to develop a comprehensive e-commerce strategy or governance regime. At a recent AU e-commerce conference held in July 2018, UNCTAD secretary general, Mukhisa Kituyi, declared, “What is needed is dialogue between private sector, government and academia on the right policies required to be implemented.” In the context of the drive to boost intra-African trade with the recent establishment of the African Continental Free Trade Area (see Sporearticle, A Promising New Continent-wide Trade Agreement for Africa), the demand for harmonised cyber legislation is particularly prevalent. On 10-14 December 2018, stakeholders from the AU and EU will come together for the first Africa eCommerce Week to discuss these challenges and pave the way to further the growth of Africa’s digital economy. In addition to the creation of an enabling environment, young digital entrepreneurs investing in online agricultural trade and e-commerce need adequate support to develop their business and technical skills. Entrepreneurship programmes such as CTA’s Pitch AgriHack play a vital role in helping ag-tech start-ups improve their technical platforms in order to remain competitive and develop increased loyalty from their clients. Supporting the growth and sustainability of these up and coming local e-commerce platforms will help Africa to effectively reap the benefits from e-commerce. In order to achieve the Sustainable Development Goals by 2030, small-scale farmers in developing countries must be involved in the transformation of agri-food systems. As climate change poses fresh challenges to farmers across ACP countries, donors, development banks and private lenders are developing innovative blended finance and risk-sharing solutions. With the global number of undernourished on the rise since 2014, the international community has identified agricultural development as an effective tool to boost the resilience of vulnerable communities in fragile states. Technology is bringing innovation to food supply chains across the developing world, especially in Africa.